Observation - black (pine?) ladybird - UK and Ireland. 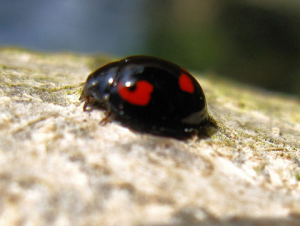 Description: Small ~4mm black ladybird with 4 red splodges on back. Seen on a walnut tree. It does seem to have the rim described. Seen in the last photo next to a 7-spotted ladybird for a good size comparison. Small ~4mm black ladybird with 4 red splodges on back. Seen on a walnut tree. It does seem to have the rim described. Seen in the last photo next to a 7-spotted ladybird for a good size comparison.